Shaykh Salih Aal Ash-Shaikh: Shariah Calls for Protection of Life and Property. 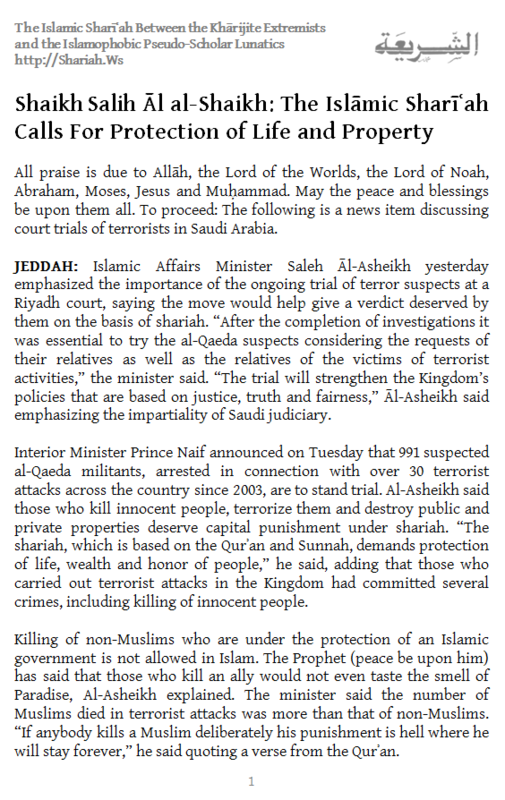 Islamic Affairs Minister Saleh Āl-Asheikh yesterday emphasized the importance of the ongoing trial of terror suspects at a Riyadh court, saying the move would help give a verdict deserved by them on the basis of Shariah. "After the completion of investigations it was essential to try the al-Qaeda suspects considering the requests of their relatives as well as the relatives of the victims of terrorist activities," the minister said. "The trial will strengthen the Kingdom's policies that are based on justice, truth and fairness," Āl-Asheikh said emphasizing the impartiality of Saudi judiciary. Download Full PDF Document.